This past year Engine 844 conducted a tour of the states, stopping in Arizona for its 100th birthday. After being completely unsatisfied with the photos taken at the Tucson train depot, I jumped in the car and headed north. I had shamelessly eavesdropped and caught a snipped of conversation between one of the train employees and a bystander. The train would be switching cars in Eloy. 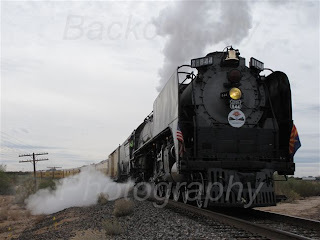 I ended up with over 30 minutes to shoot photos of a steam engine working. Now I know the reason for the fascination with trains. Magical.